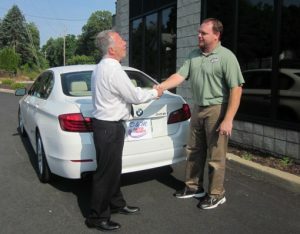 For driveable vehicles, they are raised on a lift in our inspection area and all visible damage is evaluated and then entered into our computerized estimating system. This data is compiled into an estimate that determines the cost of repair for the damage that is visible at this time. An initial estimate is helpful when deciding on whether to file an insurance claim or not. However, often there is hidden damage that cannot be seen or accounted for until after the vehicle is disassembled. After the disassembly & blueprinting process, an accurate total cost of repairs can be determined. After the initial estimate is made, we’ll schedule drop-off and repair appointment for you. 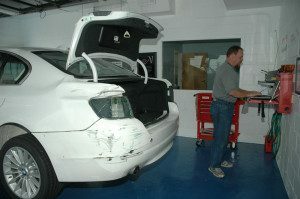 When the vehicle is dropped off at our shop, the damage is reviewed again and any non-related damage is noted. Your vehicle is then disassembled to expose any previously hidden damage. The inner structure of the vehicle is examined and measured to insure the safety of the vehicle was not compromised. The repair estimate and parts order will be updated accordingly. At this point the damage has now been fully documented. The vehicle and repair cost estimate will be ready for the insurance or customer’s review. After all the damage has been identified, most insurance companies will send an appraiser to inspect the damaged vehicle and review our repair estimate. There may be some negotiations regarding replacement part type, labor charges and what repair procedures are required to repair the vehicle properly. Our estimates are generally written utilizing new factory parts and manufactures recommended repair procedures. Many insurance companies try to reduce the repair cost by only paying for parts that are not made by the vehicle manufacture. These are known as “Aftermarket” (used parts from salvage yards), or “LKQ”, or previously damaged “remanufactured” parts. After the negotiation process, we will notify you and explain any differences between our estimate and the insurers. We will also offer any repair options at this time. Once we obtain a signed repair authorization from you, parts will be ordered and the repairs can begin. Replacement parts are ordered and, depending on the vehicle make and type of parts needed, can be received in a few days. For uncommon parts and/or vehicles, part orders could take a week or more. Before repairs begin, all replacement parts are verified for accuracy. 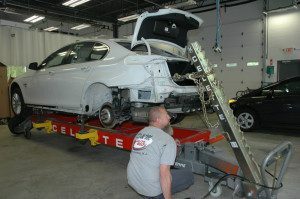 If structural damage has been determined, your vehicle will need to be mounted on a structural alignment machine. It is critical to return the structure of a vehicle back to factory specifications. 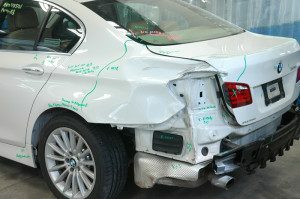 Most of the vehicle’s safety has been designed into its structure and its safety will be compromised if not completely repaired. A sophisticated computer measuring system is used to assure that an complete and accurate structural repair is performed. After your vehicle’s structure has been restored to factory specifications, if we notice any part is severely damaged, it will need to be replaced. The structure consists of many individual parts that are welded together to form the structural shell of the vehicle. This is the most critical part of the repair to ensure that the original safety and performance engineering of the vehicle is maintained. On body parts with minimal damage and on the seams of replaced welded panels, some metal straightening and filler work may be required. 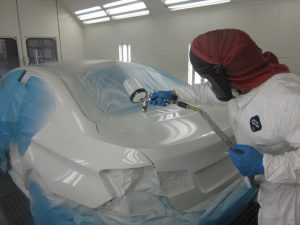 This is to achieve the original final fit and finish of the exterior body panels. The distorted metal areas on damaged panels will be returned to its original contour. Then a filler is used to cover any marks left in the metal from the straightening process. Paint preparation is a critical step that assures the proper appearance and durability of the paints finish. 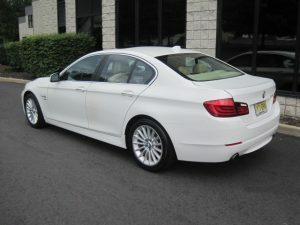 Your vehicle will be cleaned and moved into the refinishing area. Primers are applied to all repaired or bare metal areas to restore the vehicles original corrosion protection. 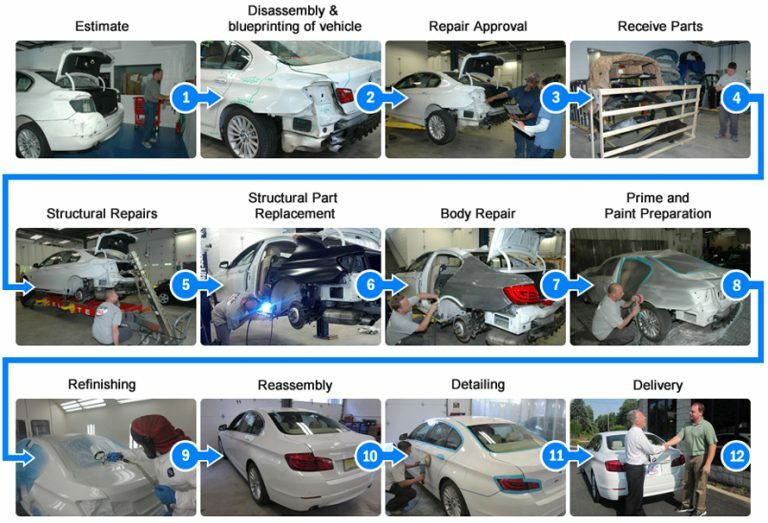 After curing, all repaired or replaced body panels go through a series of sanding preparation steps. This is required before the color and clear application. the refinishing process is complete. 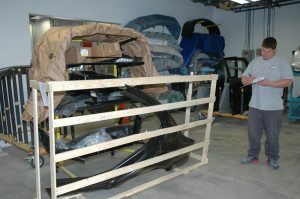 All parts that were removed during the repair including body panels, bumpers, glass, interiors and exterior trim are reassembled to the vehicle. Your vehicle’s electronic systems are checked after reassembly, and any necessary sublet work is scheduled and performed. Finally, the vehicle looks whole again and the repair is almost complete. 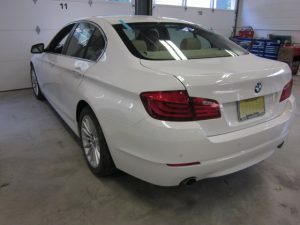 Your vehicle will be moved into the detail area and all refinished panels are inspected. 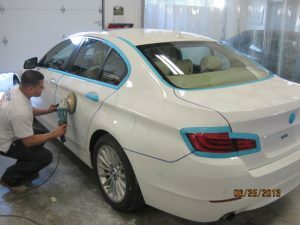 Any imperfections in the paint are removed and all refinished panels are machine waxed to achieve a uniform final finish. The vehicle will be completely cleaned inside and out, then road tested to ensure everything is working properly. A final quality inspection is performed and the customer will be contacted to schedule delivery. Delivery is the final step in the repair process. 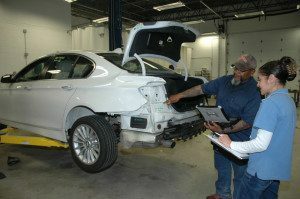 The completed repair is reviewed with the customer while inspecting the finished vehicle. Final paperwork is completed and your vehicle will be returned.